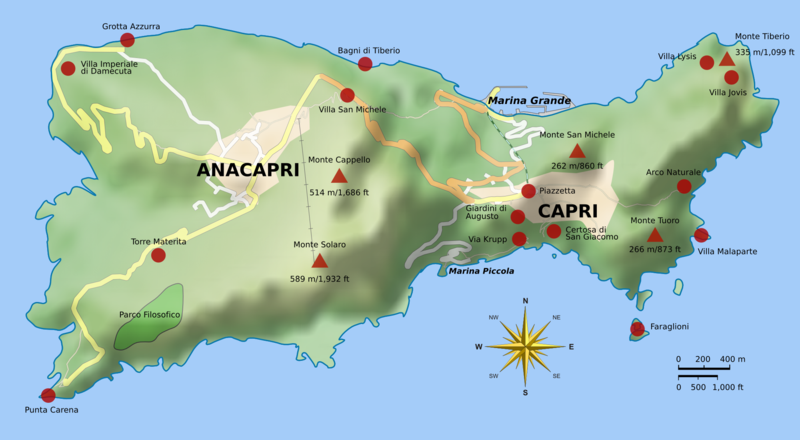 Most people travel to Capri by ferry or hydrofoil from, Naples, Sorrento, Positano, or Amalfi. The ferry takes 80 minutes for Naples, and 40 minutes from Sorrento, while the hydrofoil takes 40 minutes from Naples and 20 minutes for Sorrento. While you are on the Island you can get around on foot, or by bus. Note: if you are afraid of heights, consider an alternative to the bus ride. 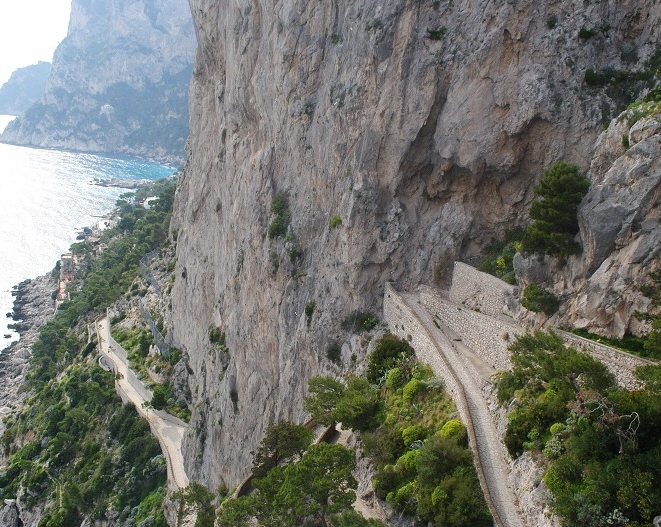 The cliffs are steep and the roads are narrow. Capri is an island in the Tyrrhenian Sea off of the Sorrentine Penninsula, on the south side of the Gulf of Naples in the Capinia region of Italy. The small Italian island of Capri is situated 5 km from the mainland in the Bay of Naples, a celebrated beauty spot and coastal resort since the days of the Roman Republic until now. The webcam takes a great shot of the Marina Grande and the port, in the background the city of Naples, and Nisida Camaldoli hill. Nice weather, during cold moths generally stays around fifty degrees, the summer averages in the eighties. The rainy season is from around late November to mid April, causing the summer to be the busy tourist time of the area. 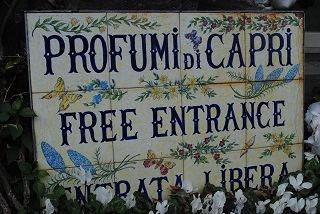 Capri is known for their sandals, jewelry and of course Limon-cello liqueur. Limon-cello is sold in bottles of every shape, size and design, also sold are Limon-cello filled chocolates. Stop by the small shops to see what treasures you might find inside. There are tours of perfume factories available, where you can see the essence of flowers turned into exquisite perfume. Faraglioni is the collective name for three stacks located off the island of Capri in the Bay of Naples. A historic paved footpath connecting the Charterhouse of San Giacomo and the Gardens of Augustus. Built between 1900 and 1902 Via Krupp was a connection for Krupp between his luxury hotel, Hotel Quisisana, and his marine biology research vessel, Marina Piccola. Scenic area where you can swim or climb the cliffs in the Green Grotto, which looks like an enormous liquid emerald. A nice place to spend a day on the beach with the fantastic view of the Fraglioni. It lays on the sunny South side of the island, sheltered from wind by a steep wall of rock, it is almost always warm. The home of Swedish physician Axel Muthe, built over the ruins of an ancient Chapel dedicated to San Michele. A number of ancient artifacts are displayed in the house, and in the garden is a Greek tomb, a granite Sphinx which looks out over the Island of Capri. The La Piazzetta, or as the locals call it "a chiazz" is capris most famous square, that is the heart of the island. There are pavement cafes on each corner of the piazza, where you get a chance to mingle with the stars of the silver screen, sipping their coffe ot cocktail at one of the bars. 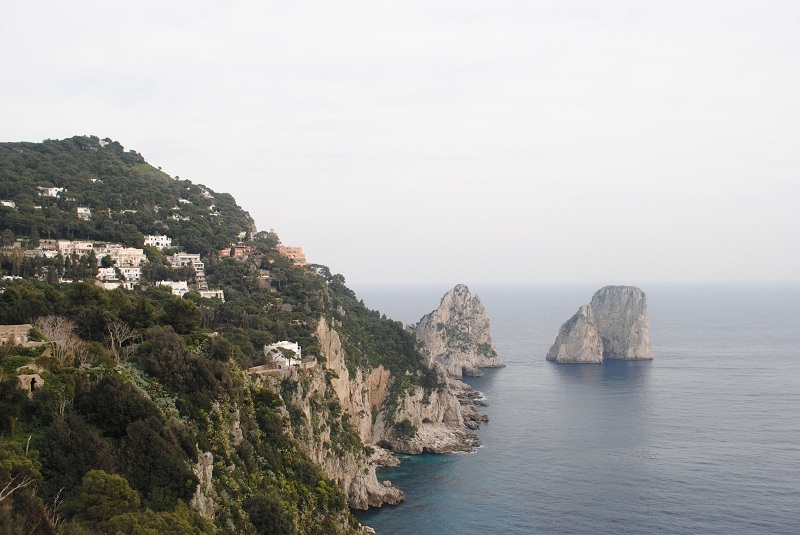 If you haven't seen Capri from the sea, you are missing out! The island is full of sea caves and secluded beaches.